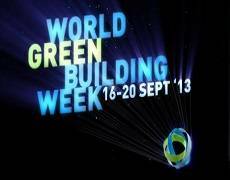 The UK Green Building Council has published a calendar of events for this year’s World Green Building Week (WGBW) which takes place from 16-20 September 2013. The theme is ‘Greener Buildings, Better Places, Healthier People’, emphasising the value of green buildings to people – whether higher productivity for office workers, improved learning outcomes for students, healthier workplaces for nurses and teachers, or better homes for people. The key messages are that green buildings make better places to live, work and play; that improving indoor and outdoor environmental quality help us to create healthier places to live and work, and that green buildings can improve well-being and quality of life for everyone in the community. The programme of events taking place throughout the week, being hosted by UK-GBC and its members include the results of the 2013 GRESB (Global Real Estate and Sustainability Benchmark) Survey hosted by Jones Lang LaSalle; Sustainable Buildings 2020 – Capturing the Global Perspective, hosted by Cundall; Keeping the Lights On: Energy and Commercial Property, hosted by GVA and a look at post occupancy studies, energy performance analysis and building optimization by Nicholas Hare Architects. UK-GBC is also hosting its own event ‘Greener Buildings, Better Places, Healthier People’ on Wednesday 18 September at the Wellcome Trust where a line-up of speakers will discuss the idea that greener buildings can lead to increased productivity and happier, healthier occupants. For more details on all the events being held during Green Building Week, click here.